This fault code is applicable to 2 different models, with different meaning. The one shown here is for the Ecotec range of models. The meaning of it is that there is a fault with the stepper motor that activates the gas valve. In order to fix this fault you will need to check from PCB to Gas valve that the electrical connection is not broken. Shown above is the Vaillant X25 connector (pointed by the yellow arrow) that connects to the gas stepper motor shown in Image 2. The yellow connector in image 2 is for the stepper motor. So check the connections between the two parts, also checking cable continuity and values if obtainable from Vaillant technical. Image 3: X25 Connector diagram. Shown Image 3 is the electrical diagram for the gas valve showing stepper motor connection to the X25 connector. 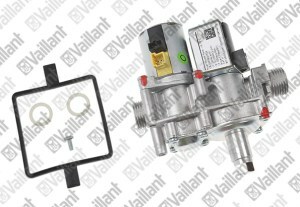 Following is a list of Gas Valve part numbers for a range of Ecotec boilers.